** 3/4. Two of the debuting Power Raiders did stero space flying tiger drops; only 3 other wrestlers had been able to do that move at that point. *** 1/4. Octagoncito submitted Espectrito, setting up a title match. ****. Rudso won in straight falls, setting up Fuerza vs Metal for the tag titles. *** 3/4. Straight falls, Estrada & Parka fighting each other to the back to leave Panther to be beat. 2) Fuerza Guerrera, Louie Spicolli, Psicosis b Heavy Metal, Latin Lover, Rey Misterio Jr.
3) Máscara Año 2000 & Universo 2000 b Máscara Sagrada & Tinieblas Jr.
*** 1/4, 14:50. Samurai powerbombed Nagata. 12:23, ***. Saito pinned Iizuka with a top rope senton. 14:37, **1/4. Cat submitted Sagrada. ** 1/2. Psicosis worked as a tecnico. Straight falls, semi-aborted match when Sagrada broke his clavicle 3:00 in first fall. He ran to the back in pain while Psicosis fought 2 on 1. 19:29, one fall, *** 1/2. Hamada pinned Panther. 19:59, *** 1/4. Perro Aguayo and Hiro Sito were seconds. billed as for the UWA Junior Heavyweight title, but the belt was actually Santo's UWA Welterweight title. Honaga was already IWGP Junior Heavyweight champion. Santo hurt his shoulder in the second half of the match. Perro sprayed freeze spray on Santo's shoulder and fought with Saito to distract the crowd. Santo recovered and soon did a dive. Honaga won on a low blow and a top rope elbow drop. 15:10, *** 3/4. Sasuke broke his foot in two plays the day before and could not walk, but managed to get thru the match anyway. Match was built around the injury. 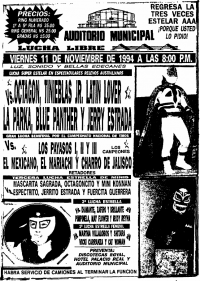 4) ?, Ángel Blanco Jr., Fishman DQ Lizmark Sr., Máscara Sagrada, Perro Aguayo Sr.
**** 1/4, 23:54. Fuerza pinned Heavy Metal to set up a tag title match. 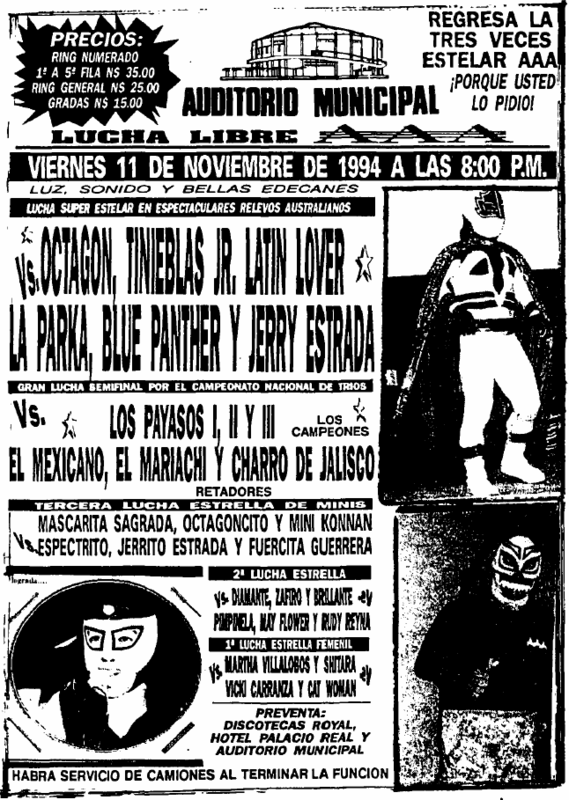 Panther gave Konnan a piledriver.